The ribbons are simple if you have a microwave. 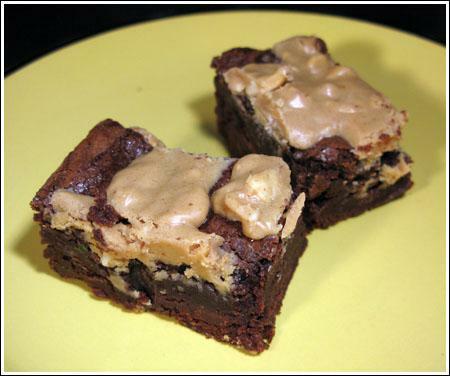 If you are in a hurry, you could try this with boxed brownie mix. The ribbons are also very good in regular peanut butter cookies. Preheat oven to 350 degrees F. (180 C). Line an 8 inch pan with non-stick foil or parchment paper. Prepare ribbons first. In a microwave safe bowl, combine pb chips, pb and butter. Melt on high 30 seconds. Stir until smooth. Spoon a rectangle (don’t worry too much about size, but try to make it at least 6 inches long) onto a plate lined with wax paper. Chill for 30 minutes or until set. Prepare batter. In a medium-sized microwave-safe bowl, melt the butter on high. When butter is melted, stir in the sugar. Return the mixture to the microwave and heat until mixture is very hot, but not bubbling (1 minute). Stir well to help dissolve some of the sugar. Stir in the cocoa, salt, baking powder and vanilla. Add the eggs, beating till smooth; then add the flour and chips, stirring until combined. Spoon half of the batter into prepared pan. Remove peanut butter ribbon mixture from refrigerator and slice into long, thin strips (width & length will vary). Lay half of the strips over the chocolate batter, then spoon remaining chocolate batter over strips. Bake the brownies for 25-27 minutes, until a cake tester inserted into the center comes out dry. Remove them from the oven and immediately lay remaining strips decoratively over hot brownies -- pressing them gently Let cool completely on a cooling rack, then transfer to refrigerator to chill for a few hours. Lift from pan and slice into squares. Makes 16 or more, depending on how you cut them. I have an urge to bake this weekend and I think I might have found the recipe. Those look awesome, thanks for sharing. Cara, thanks so much! I’m glad you’re enjoying the blog. Amy, aside from order the peanut butter chips on-line, you could try using white chips. The peanut butter chips do add extra peanut butter flavor, but their main function is to help firm up the peanut butter and keep it from being absorbed into brownies. So give white chips a try. If you want to order, you can buy them on-line. I typed “peanut butter chips” into Google and came up with quite a few sources. Hendria, I’ve noticed you seem to like the peanut butter recipes…you must love it as much as I do. These brownies look delicious! I love chocolate and peanut butter together, and I can’t wait to make them for my family. Actually, EVERYTHING you make looks delicious, and I really enjoy reading your blog. Thanks for all the great recipes.